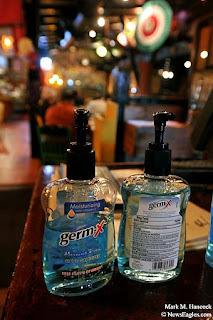 Guests are welcomed with hand sanitizers before getting prevention advice about swine flu (2009 H1N1) during the LULAC Chorizo and Menudo Breakfast at El Ranchito Restaurant in Dallas on Saturday, May 2, 2009. 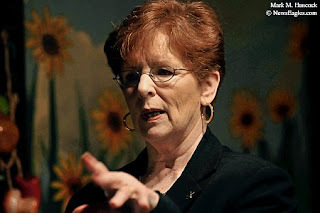 Mildred Freeby, a registered nurse at Mountain View College, gives prevention advice about swine flu (2009 H1N1) during the LULAC Chorizo and Menudo Breakfast. 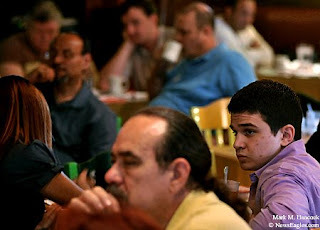 Luis A. Salazar (right) listens to prevention advice about swine flu (2009 H1N1) and election information during the LULAC Chorizo and Menudo Breakfast. 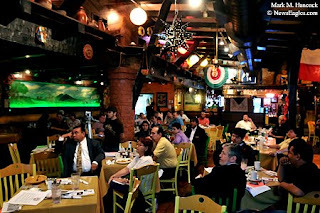 Guests listen to prevention advice about swine flu (2009 H1N1) and election information during the LULAC Chorizo and Menudo Breakfast at El Ranchito Restaurant in Dallas.